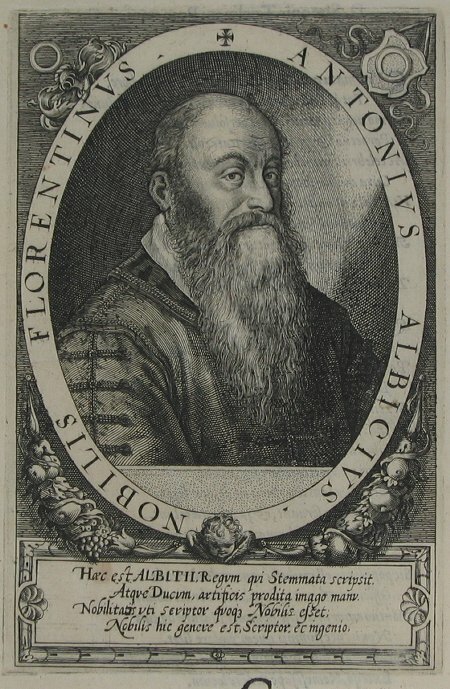 Italian jurist and genealogist, born in Florence in 1547. In 1576 he was in the service of Cardinal-Archduke Andreas of Austria. In 1585 he converted to Lutheranism and spent the rest of his life in the Protestant Imperial City of Kempten, where he died in 1626. His most famous work was Principum Christianorum Stemmata [Augsburg 1612], an unusual collection of engravings showing the family trees of the leading royal and noble houses of Europe of that time (and unusually also including the genealogy of the Turkish Emperors). These fine decorative engravings include family trees, portraits and coats of arms and are set against the backdrop of City views and panoramas closely copied from the Civitates Orbis Terrarum of Georg Braun & Franz Hogenberg [1572-1618].